Progenesis is a research driven company. Our lead scientists are constantly working on developing new approaches to further our understanding of embryo development and solve some of the challenges we face in reproductive medicine. In a recent publication in collaboration with University of Southern California, we sought to examine the relationship between time-lapse morphokinetics (TLM) and mitochondrial content (MC) to determine if they could be used as potential biomarkers in embryo selection. In this study, we examined the relationship between MC, TLM with ploidy status during human embryo development. Our results showed that MC in embryos declined between day 3 and day 6. We also found that embryos that took longer to form blastocysts had higher MC in both cell groups. Furthermore, day 6 MC was lower in euploid versus aneuploidy embryos, and lower in blastocysts versus arrested embryos. MC was measured using Mitosure® score; a high MC was defined as a MitoSure® score greater than 2. These high MC embryos took an average of 12.45 hours longer to form blastocysts than those with a MitoSure® score less than 2. Our findings show that a lower MC is associated with euploidy and blastulation. 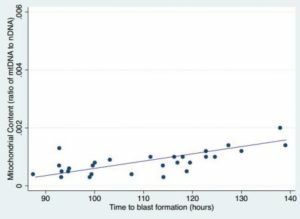 Figure 1 shows MC increases as the time to blastocyst formation increases. Combining blastulation timing and MC along with morphologic grading and euploid status may offer a new direction in embryo selection. In a separate study, we have shown that Mitosure® decreases overtime during embryo development in all embryos, but at a higher rate in euploid embryos compared to aneuploid embryos (see below).